removing two or more filters from a formula. Let's start with removing a single filter. 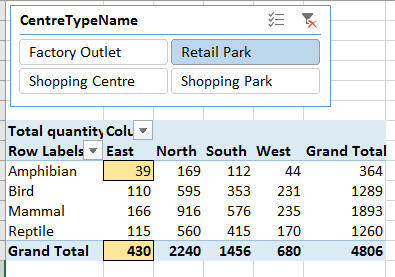 The figure for the cell shown shaded should equal 39 (total sales for amphibians for the East quadrant for Retail Park centres) divided by 430 (the same figure, but for all species). This equals 9.07%. 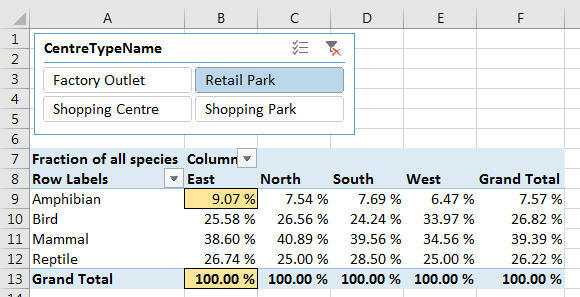 Take the total sales for the current species, quadrant and centre type, and divide this by the total sales for all species for the current quadrant and centre type. We're relaxing the species constraint which would otherwise be imposed by the pivot table cell's position within the pivot table. 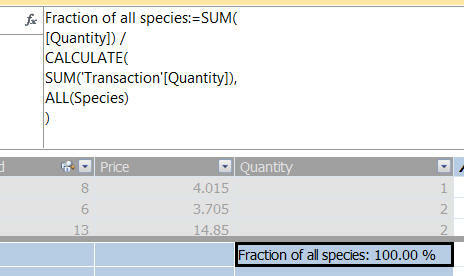 Calculate the total quantity for the current query context, and divide it by the same figure but without any species constraint (ie for all species). As a quick sense check, it's vital that the grand totals at the bottom of each column are 100%. You can have as many additional filters as you like in the CALCULATE function. 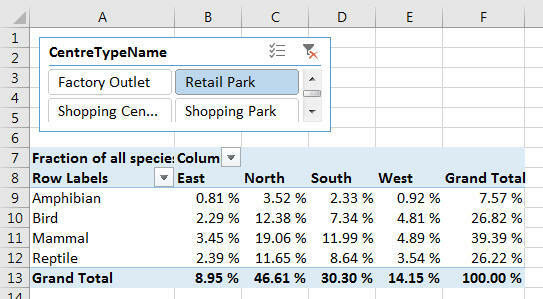 For example, you might want to show total sales for a particular pivot table cell as a percentage of total sales for that pivot table cell's query context, but for all quadrants and all species. Divide the figure for the current query context by the figure for the current query context without any quadrant or species constraint. The figure for amphibians in the East quadrant is 39 (total sales for amphibians for the East quadrant for Retail Park centres) divided by 4806 (total sales for all species for all quadrants for Retail Park centres). This equals 0.811%. You can use the ALLEXCEPT function to remove every filter but one from a formula (although to get it to work you first seem to need to combine the fields you're filtering by into a single table, using the RELATED function). So much for removing filters; what happens if you want to replace them?